The 8K TV state of play, according to LG, Samsung, Sony and more | What Hi-Fi? Forget 4K if you can - these are the most impressive 8K TVs we spotted at CES 2018. Never content to sit and enjoy the fruits of its labours, the consumer tech industry is always looking ahead to The Next Big Thing. And for plenty of TV manufacturers, that's 8K TV. There are 7680 x 4320 pixels in an 8K resolution. That's four times as many as 4K Ultra HD, and 16 times the number of Full HD. In short, that's a huge leap in terms of resolution and, potentially, picture quality. This isn't the first time 8K resolution has reared its many-pixelled head at the Las Vegas-based consumer technology trade show. Back in CES 2015, LG and Samsung showed off 8K displays while Sharp made a wild claim about its 85in 8K TV going into production. While manufacturers, broadcasters and content creators focused on making the 4K ecosystem a reality in the intervening years, CES 2018 brought the 8K brigade out in force once more. Manufacturers showed off massive-screened prototypes of 8K displays with latest and next-gen tech to impress us. LG got the ball rolling before we even set foot in Las Vegas, announcing a mammoth 88in 8K OLED display. This isn't just the largest OLED screen produced so far (current screens max out at 77in), it's also the first 8K OLED screen. The only 8K screens we've seen until now have been LCD panels, such as Sharp's LC-70X500. No word on pricing, no word on if it's actually going into production (the 88in model is likely a one-off), no word on when or if a range will be revealed - but it did wow us with vivid 8K demo footage. Samsung went one further at CES 2018, announcing its new 8K AI QLED TVs will be on sale by the end of this year. That's QLED, not OLED of course - Samsung continues to champion the quantum dot display technology. The 8K QLEDs will have an intelligent upscaling algorithm (the 'AI' in the branding) that can upscale any source to 8K while improving detail and depth, as well as cleverly learning (and storing in its database) the best processing tools to use depending on the content type. While we only saw a limited 8K animation on display, it looked spectacularly detailed - as did the upscaled Full HD and 4K pictures. The international launches will start with Korea and the US during the second half of this year. No word on pricing or screen sizes yet, but we expect to hear details soon if they'll be going on sale. Sony dazzled us with prototypes of its upcoming next-gen picture processor - the X1 Ultimate - powering yet another prototype: an 85in 8K HDR LCD display. Not only is the new chip capable of handling and enhancing 8K resolution, it's also capable of outputting a mindboggling 10,000 nits - maximum peak brightness that current HDR standards such as Dolby Vision HDR allow for (compared with HDR10's 1000 nits top limit). With 8K footage of wildlife, landscapes and Gran Turismo Sport on show, it looked glorious. Unlike the eye-searingly sharp, overly processed look we sometimes see with higher resolutions, this Sony prototype looked breathtakingly natural and realistic while retaining its intensity. We're more likely to see X1 Ultimate-powered 4K TVs in production before the year is out, but we wouldn't be surprised to see Sony's 8K once again hitting the headlines by the time CES 2019 rolls around. Panasonic was the only one of the 'Big Four' TV manufacturers to not showcase an 8K display, so we instead turn our attention to Sharp's medley of 8K TVs. Along with a "multi-visual" 85in LCD 8K display and 27in 8K display module, it was Sharp's 70in LC-70X500 8K TV that still caught our attention. 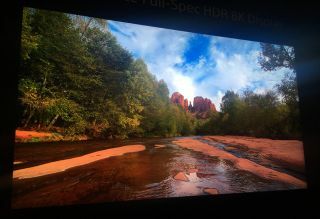 This 'AQUOS 8K' LCD screen with HDR10 and HLG was first announced at IFA 2017, claiming to be the first consumer-ready 8K TV to go on sale this year - for $73,000. Considering nearly all the 8K screens we saw at CES 2018 were prototypes rather than fully-fledged TVs, Sharp's 70in 8K telly - despite not being a CES 2018 exclusive by a long chalk - is one we'll be keeping our eyes on this year. Even with that massive price tag. It's due to hit stores in March 2018 in Japan and China, while those of us in Europe and Taiwan will have to settle for an 8K monitor, the LV-70X500E.